The oldest volcanic deposits of Mount Etna are 230.000 years old; the constant activity of the volcano has been noted for the last 3.500 years and especially the last 400 years are well documented. Historic eruptions are recorded for the year 479 B.C., 1329, 1381 and 1536, one of the largest and most destructive eruptions was a flank eruption in March-July 1669 which produced the cinder cone of Monti Rossi and a 14 km long lava flow which, despite it was partially deviated from its path by an artificial dam, destroyed part of the city of Catania, obstructed the harbour and caused a lot of victims. Cinder cones on the slopes of Etna erupted again in 1763, 1811, 1852, 1865, 1879 and 1892. In the 20th century, concentrated on two main branches extending from the crest, lava erupted in 1908, 1910, 1911, 1918, 1923, 1928, 1942, 1947, 1949 and 1950-1951, 1964, 1968, 1971, 1981, 1983, 1989 and 1991 (the most voluminous eruption since 1669) to 1993. The activity continues well into the 21th century. Since 2001 Etna is more or less active (in 2002 and 2003 the volcano produced spectacular ash plumes), with a short pause in 2008, since 2011 the volcanic activity increased again. The constant activity and the spectacular size of the volcano made it an important destination of early travelling geologists. Fig.1. 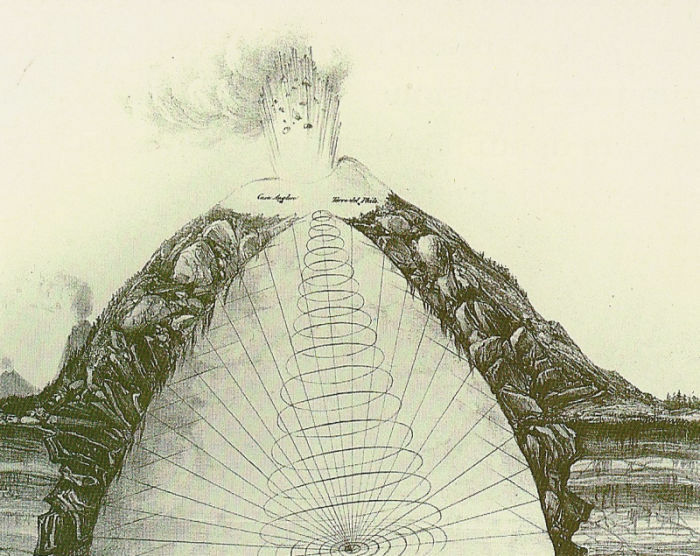 The volcanic eruption of Etna explained by a whirlwind emanating from the underground, according to Comte A. de Bylandt-Palstercamp (1836): "Théorie des volcans". This reconstruction was based by observations of ancient scholars and myths, especially the believe that earth is formed by the interactions of the four elements: water, earth, fire and air. Lord William Hamilton (1730-1803), British ambassador in Naples, became fascinated by volcanoes and Mount Vesuvius. Hamilton used the vegetation cover to estimate the age of the lava flows of Vesuvius and also for the vegetation covered cinder cones of Mount Etna he assumed a very old age. These old ages implied that volcanoes can be active for thousand of years, maybe even longer times, an important insight in a time when earth was considered only 6.000 years old and volcanoes only local features, with little to no significance in shaping the landscape. Fig.2. View of Mount Etna from Hamilton´s "Campi Phlegraei, Observations on the Volcanoes of the Two Sicilies"; Plate 36, Mt. 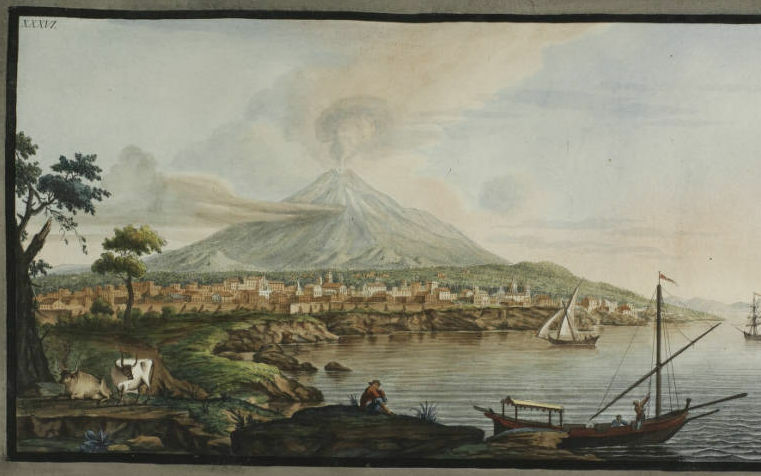 Etna (1776), based on a painting by Pietro Fabris (an artist hired by Hamilton to illustrate his research); the volcano was quiescent when they visited Sicily in 1769. The lower slopes of the mountain are dotted with minor cones, the prominent double cone of Monti Rossi (on the left) had been formed during the great eruption of 1669, together with a huge lava flow (visible behind the buildings) that had threatened to engulf the city of Catania. Based on the assumed local nature of volcanoes, the French geologist Elie de Beaumont, following research by the eminent German geologist Leopold von Buch, published in 1838 a study suggesting that Etna lavas had been erupted in thin sheets on a subhorizontal surface, accumulating to a considerable thickness and only later tilted and pushed upwards by intruding magma. Volcanic craters where according to this popular hypothesis caused by the elevation of the ground, breaking apart the lava would simply flow out of the so formed hole. Charles Lyell visited Etna on a number of occasions and in 1858 published a monograph: "On the Structure of Lavas which have consolidated on Steep Slopes: with Remarks on the Mode of Origin of Mount Etna and on the Theory of "Craters of Elevation." "...we must abandon the elevation-crater hypothesis: for although one cone of eruption may envelop and bury another cone of eruption, it is impossible for a cone of upheaval to mantle round and overwhelm another cone of upheaval so as to reduce the whole mass to one conical mountain." Finally a volcanic eruption in the Mediterranean Sea will confirm Lyell´s observations and make it clear that volcanic mountains don´t form like a bubble, but grow over time: this important event in the history of geology will be the birth of the island of Ferdinandea, explored by the crew of the ship "Etna". Fig.3. 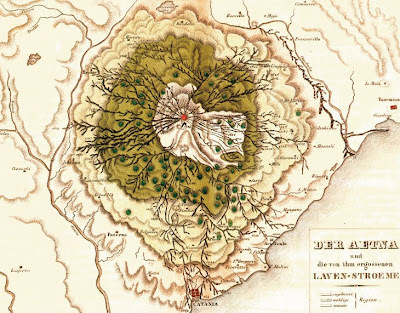 Topographic map of Mount Etna in 1823 (reprinted in 1844 in Leonhard "Vulkan Atlas") by Mario Gemmellaro, displaying lava flows, cones and villages in the surroundings of the volcano.